← Will new tools help to “save” the economy? Much later, the “Great Inflation” was pinned on poor monetary policy. How long will it take to blame monetary policy for the “repressed economy” since 2008? The conflicting conclusions from these “old” arguments are still present today! Although the recent run-up in oil prices is comparable in magnitude to the first two OPEC shocks, its effects on the economy seem to have been very different. Textbook accounts of the 1970s and early 1980s blame “supply shocks” (which included sharp rises in the price of food as well as oil) for the prolonged periods of both high unemployment and high inflation, or “stagflation,” that followed. By contrast, the most recent increase in oil prices appeared to have very little effect on the expansion that followed the 2001 recession. (While the US economy did enter a recession at the end of 2007, this was widely attributed to the collapse in consumer and business confidence that attended the subprime crisis and subsequent financial panic.) Similarly, core consumer price inflation – inflation excluding food and energy prices – was relatively stable over this period, which again contrasts sharply with the earlier episodes. One interpretation of the experience of the past several years is that it vindicates “revisionist” views of the role played by oil shocks (and other supply shocks) in precipitating the stagflation of the 1970s. According to this view – variants of which have been propounded by DeLong (1997), Barsky and Kilian (2002), and Cecchetti et al. (2007) – the root cause of the abysmal macroeconomic performance from 1973 to 1983 was poor monetary policy, not the oil shocks. The implication that almost all of the downturn of 2008 could be attributed to the oil shock is a stronger conclusion than emerged from any of the other models surveyed in my Brookings paper, and is a conclusion that I don’t fully believe myself. Unquestionably, there were other very important shocks hitting the economy in 2007-08, first among which would be the problems in the housing sector. But housing had already been subtracting 0.94% from the average annual GDP growth rate over 2006:Q4-2007:Q3, when the economy did not appear to be in a recession. And housing subtracted only 0.89% over 2007:Q4-2008:Q3, when we now say that the economy was in recession. Something in addition to housing began to drag the economy down over the later period, and all the calculations in the paper support the conclusion that oil prices were an important factor in turning that slowdown into a recession. 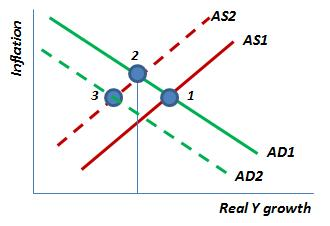 Let´s consider Jim´s arguments first: There´s no doubt, just imagining a dynamic AS-AD model that a price shock increases inflation and reduces real output, so Jim´s conclusion is not special. But the strength of the oil price effect on real output is predicated on how the Fed reacts to the shock. There´s an interesting experiment to be made. In 2003-2006 the economy was buffeted by an oil price shock that was even stronger (higher percent price increase) than the one that occurred in 2007-08. This is shown in the charts below. As the next charts indicate, in the 2003-06 period NGDP growth was kept stable, so that RGDP growth was only little reduced. This was not the case in 2007-08. In the later period, the Fed remained so worried about inflation that it kept contracting NGDP and that´s the reason a “run of the mill recession” became “Great”! Going back to Blinder, he´s very off hand about the “Great Recession”. Unlike the 1970s, he thinks it had nothing to do with monetary policy. Maybe that reflects his concentration on the inflation side of the ledger! This entry was tagged Alan Blinder, Great Inflation, James Hamilton, Oil Shocks, Repressed Economy. Bookmark the permalink. It took Japan 20 years to move away from a zero interest rate policy, in embrace quantitative easing. By that standard the US has probably more than 10 years to go. These are rather silly arguments as I’m sure these people are aware that things like oil shocks and market panics have an impact on the stance of policy, thus overall economic conditions in the absence of accommodation by policymakers regardless of whether the shock is positive or negative. Otherwise, there would be no real purpose in having a central bank – we could just take them all raw, come what may; pontificating bureaucrats only exacerbate the raw. Bonnie, I think they believe in what they say. In 1979, Blinder wrote a book “Economic Policy and the Great Stagflation”.. On page 21: “Just as monotheists believe there is only one God, monetarists believe there is only one cause of inflation:increases in the supply of money. Hamilton has been a “fan” of the oil explanation for recessions since he published his firts paper on the matter more than 30 years ago!